At 10:24 pm on Tuesday night March 18, 2014 (02:24 UT March 19) seven all-sky cameras of Western's Southern Ontario Meteor Network (SOMN) together with two cameras operated by NASA's Meteoroid Environment Office located in Ohio and Pennsylvania recorded a bright fireball in the evening sky over the northern shore of Lake Erie. The fireball was seen widely by observers throughout southern Ontario and adjacent areas. The fireball was first detected by NASA and Western camera systems at an altitude of 75km over Port Dover moving westwards at 14 km/s. The meteoroid was initially the size of a basketball. At its brightest, the fireball was slightly fainter than the full moon. 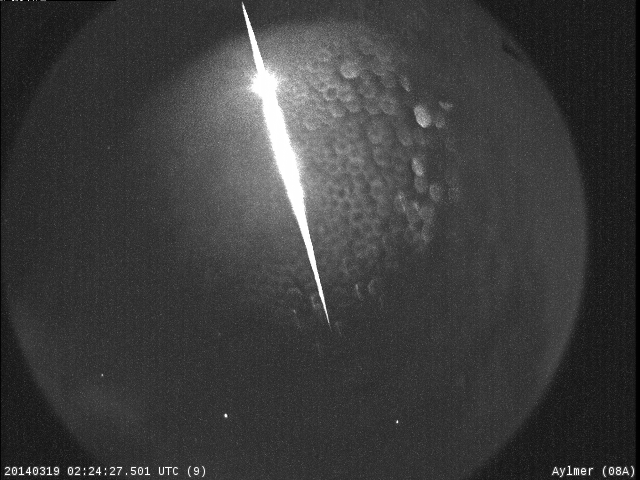 Analysis of the all-sky camera records indicates that this slow-moving and bright fireball was large enough to have dropped meteorites in a region just to the north and northwest of the city limits of St. Thomas. One or more fragments golfball to softball-sized may have reached the ground.